Product Dimensions (L x W x H): 34" x 7" x 27"
Display this FULLY ASSEMBLED Lynx in your home or office! She is an Americas Privateer and interpretation of an American letter of marque vessel of the same name from 1812. Master craftsmen using historical photographs, drawings or original plans meticulously handcraft these highly detailed wood models from scratch. They are built to scale with high-grade wood such as: western red cedar, rosewood, and mahogany. They are 100% hand built individually using plank-on-frame construction method and are similar to the building of actual ships. Each model requires hundreds of hours to finish and must go through a demanding quality control process before leaving the workshop. This beautiful Lynx model features: two tone black and white painted hull, plank on frame and two decks. The front bowsprit and two large masts are connected securely using advanced rigging and lines painstakingly knotted and fastened by hand. Each yard has an attached hand-stitched unfurled sails made of fine linen. Metal anchors and a wooden rudder are visible on the front and rear of the ship. On the deck, there are stationed cannons, authentic hand-built lifeboat with ribs and planks, wooden cabin, wooden crane and many other wooden pieces. This model comes standard with a solid wood base and brass nameplate. 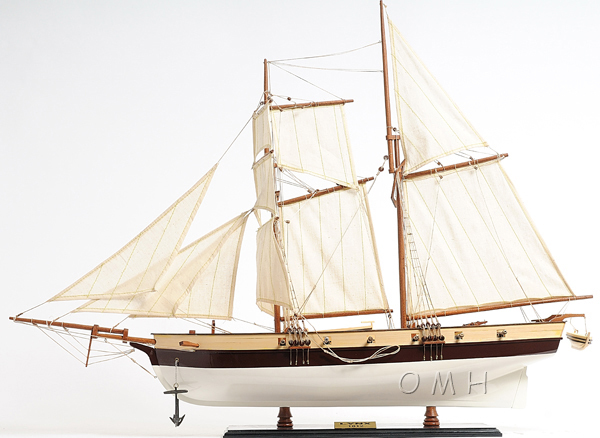 Itll make a perfect gift for home or office decorator, boat enthusiast or passionate collector. Lynx is a square topsail schooner based in Newport Beach, California. She is an interpretation of an American privateer vessel of the same name from 1812. The original Lynx played its part in running the British blockade, assisting the then almost non-existent American naval forces, and defending the American coastal waters and merchant ships against the Royal Navy. Today, instead of fighting the British like her original counterpart, she serves as a sailing classroom. Lynx offers an early American history program as well as a life, earth and physical science program to schools. She teaches seamanship and history to those who step on her deck.